Sen. John McCain is denying Lebanese media reports that he posed with known kidnappers during his recent visit to Syria. Two men pictured next to Mr. McCain were responsible for kidnapping 11 Lebanese Shiites, press from that country is claiming, as reported in the Daily Mail. And nine of those abducted are still being held hostage, the Daily Star in Beirut claims. The two suspected kidnappers — Mohamed Nour and Abu Ibrahim — in the photo with Mr. McCain are members of the Northern Storm militant group, who are believed to have planned and executed the abduction, the Daily Star said. Mr. McCain’s office went on the defensive, issuing a statement through spokesman Brian Rogers. 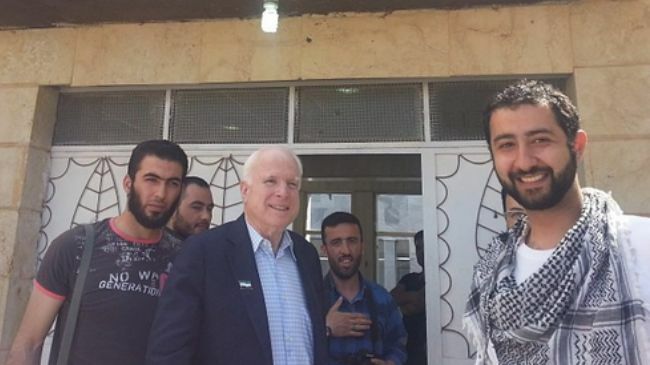 “A number of the Syrians who greeted Sen. McCain upon his arrival in Syria asked to take pictures with him, and as always, the senator complied,” he said, as quoted in the Daily Mail. “[It] would be regrettable” if those pictured with the senator were kidnappers, he added. He spoke about his visit on CNN Wednesday night. "We can identify who these people are. We can help the right people," he said.